Kampala (Agenzia Fides) - The Catholic Bishops of Uganda have announced their intention to start a new national Catholic Television. In a press statement that was released on June 8, 2018 by the bishops after their annual Plenary Assembly held from June 4-8, 2018 in Kampala, the prelates said they are in the process of establishing a national Catholic television, called Uganda Catholic Television (UCT). "As a Catholic Church, after getting a license from the Uganda Communications Commission, we are now in the process of establishing a national Catholic Television", the bishops said in a press statement that was signed by the chairman of the Uganda Episcopal Conference, Most Rev. John Baptist Odama, also the Archbishop of Gulu Archdiocese. They further said that the new television will be tailored to promote the work of evangelization and integral human development in the country. Meanwhile, in the same press statement, the bishops have called upon the Ugandan Government and all security agencies to scale up their efforts to protect the life and property of Ugandans. The prelates noted that for some time now there has been an increase in kidnappings, organized crime and killings in the country. The bishops also observed that the government has worked out a new National Sexuality Education (NSE) program which gives guidelines to schools, and have said that the NSE program, though containing some valid ideas and guidelines, fails to answer some crucial questions and address in an adequate manner some important issues. Furthermore, the church leaders said, the information and life skills provided for upper level students are "open to interpretation and practices which may be contrary to moral Christian values". They also added that the program provides "no provisions or guaranties that school teachers are prepared and able to teach in a balanced and proper way such delicate and emotionally charged topics". They further stated that the NSE document is now undergoing a final evaluation by Catholic experts who are compiling suggested amendments to the program. 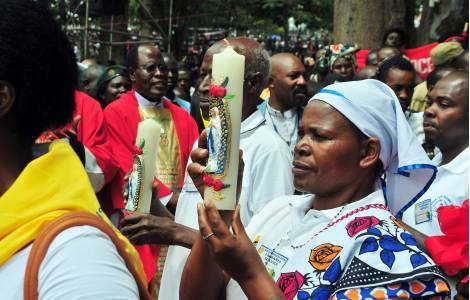 However, should the document remain unchanged, with provisions and directives contrary to the Christian values shared by the Catholic Church, Church of Uganda and the Orthodox Church, the prelates have emphasized that the document will not be introduced and taught in their Christian-founded schools. The bishops have also raised their concern on the current situation of the refugees in the country. They said that they have considered the need of providing the refugees with adequate pastoral and spiritual care hence, are calling for a generous move by the diocesan priests and members of religious congregations present to volunteer and go at least for some time to work in the refugee camps, in collaboration with the local clergy.